I hope you've been enjoying the movie snack ideas I've been sharing as part of my ongoing collaboration with Netflix! Each month, I create a fun recipe that goes along with a movie playlist theme. I've already shared my James and the Giant Peach Hand Pies and a yummy Chocolate Peppermint Smoothie to enjoy on road trips to grandma's house. This month's theme is "Laughter is the Best Medicine," and features a collection of funny movies designed to cheer kids up when they're home sick from school. 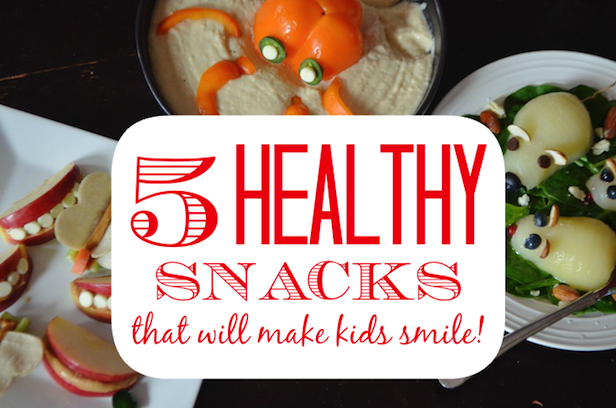 To go along with the funny movies, I'm sharing 5 funny healthy snack ideas for kids that will also be sure to put a smile on their faces when they need it most. Check out the ideas below! A fun way to get kids to eat their greens! 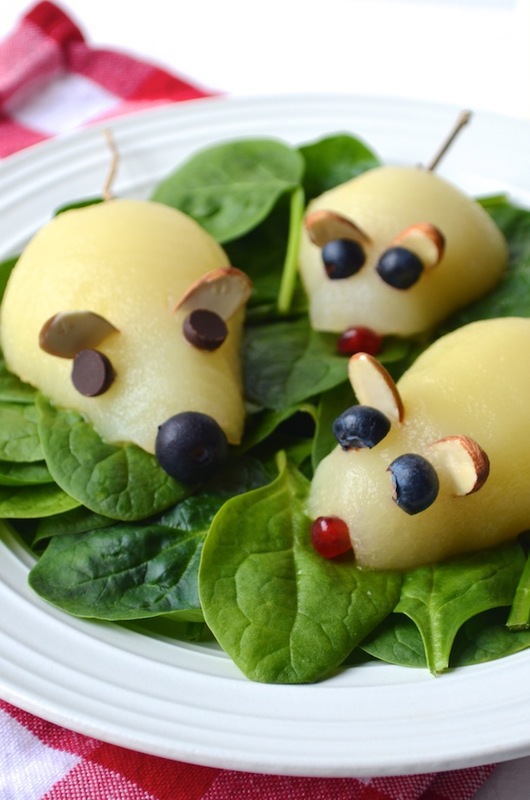 Top fresh raw baby spinach with peeled and halved pears (either fresh or canned) decorated to look like an adorable mouse family. 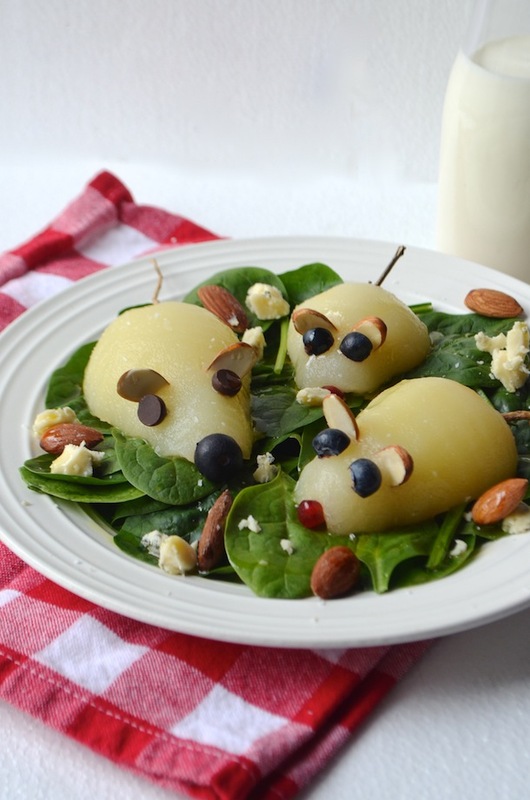 To Make: decorate the pear halves with sliced almonds for ears, and use blueberries, pomegranate seeds, or chocolate chips to make the eyes and nose. If the kids aren't feeling well, it's probably best to keep the salad plain, but when they're back to 100% you can dress it up a bit with crumbled cheese, more nuts, and a simple dressing of olive oil and lemon juice. It's a cute and healthy treat your kids will enjoy eating! Pancakes are the ultimate comfort food, and a delicate treat that will go down easy. Even better when they look a little silly! 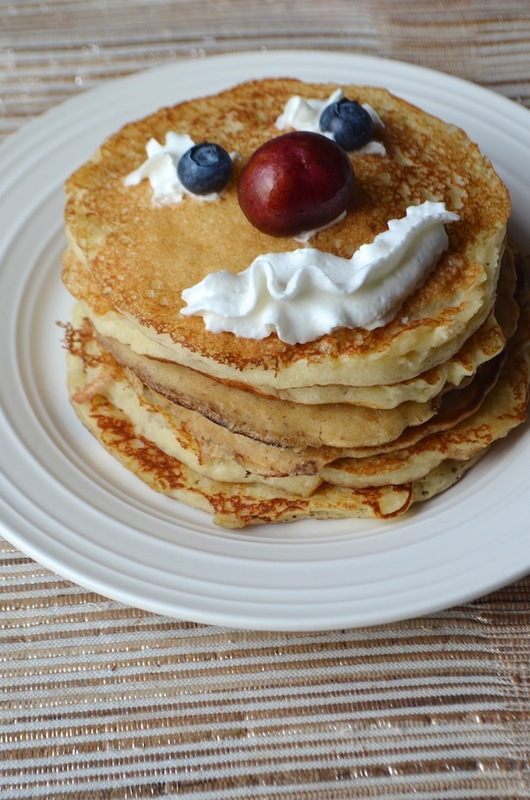 To Make: Whip up a batch of your favorite pancakes--I recommend these fluffy whole wheat cinnamon pancakes or my favorite blueberry buttermilk pancakes--and serve topped with a fresh fruit smiley face. You can use small dollops of cream cheese or whipped cream to make the eyes and mouth (just a little bit is enough! ), and a big round cherry or grape for the nose. And remember that pancakes are not just for breakfast--they're also perfect for dinner, too! How adorable is this little fella?! I spotted this idea on Pinterest ages ago, and have been wanting to recreate it, because it's just so cute. 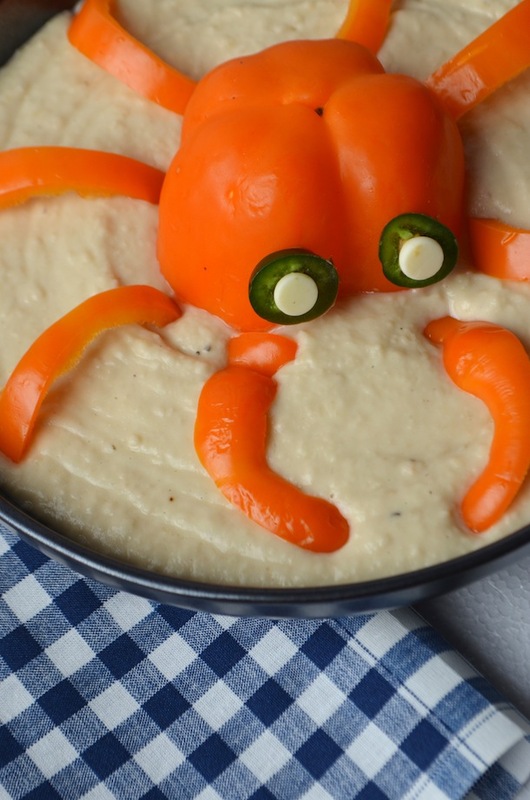 Hummus and veggies are an easy healthy snack popular with kids, and this presentation is guaranteed to make them laugh. To Make: fill a wide, shallow bowl with hummus or your favorite healthy dip (herbed yogurt or another kind of bean dip would work well, too). Then cut a bell pepper in half (use your favorite color, although I think red or orange work best), and place the bottom half with the cut-side down in the dip. Slice the remaining pepper into 8 strips and arrange around the body. For eyes, you can use sliced black or green olives, or small slices of jalapenos (that's what I did). I used white chocolate chips as the eyeballs and a dab of peanut butter on the back of each as the "glue." Serve with some additional dippers like carrot or celery sticks, or slices of warm whole grain pita bread. Apple slices with peanut butter are a classic snack for kids (of all ages--it's one of my own favorites!). The addition of a few white chocolate chips turns these into a funny little treat. To Make: Slice a red apple into 1/2" wedges. Coat one side of the apple with creamy peanut butter, and then sandwich with another slice on top. Press white chocolate chips into the peanut butter to make "teeth." For the "tongue," you can use a slice of cherry or strawberry. If your kids can't eat peanut butter, this also works well with almond butter or sunbutter. 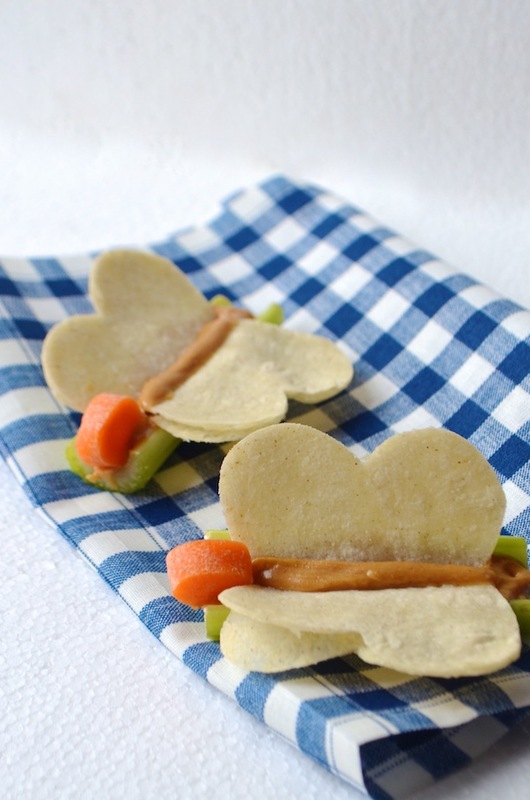 A small heart shaped cookie cutter is the only special tool you need to make these cute little butterfly snacks for kids! To make, use a small heart shaped cookie cutter to cut out circles from a tortilla--both corn or flour work, so pick your kid's favorite! Cut the bottom of the hearts off to make the wings. Spread the 2" celery sticks with your favorite creamy peanut butter, and then tuck the "wings" in on each side. A little round carrot slice works as a head (you can also use a berry or grape). Tip: These have a tendency to flop over a bit when on a plate, so use a little bit of peanut butter spread on the bottom of the celery to "glue" it onto the plate. I hope you give some of these ideas a try!